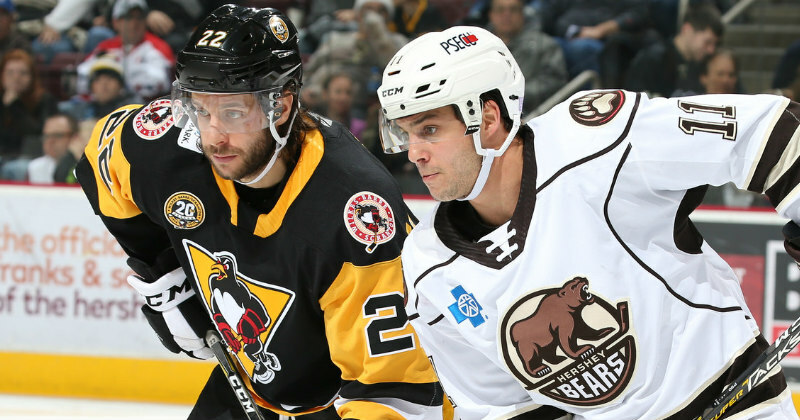 11/28/2018 - Jayson Megna scored for a third straight game, but the Hershey Bears dropped a 3-1 decision on Wednesday night to the Wilkes-Barre/Scranton Penguins on Hersheypark Pass Night at Giant Center. Thomas Di Pauli scored two goals for the Pens in the first period. The theme of breakaways headlined the first period for both the Bears and Penguins. At 6:38 of the first period, Liam O'Brien was awarded a penalty shot after being hauled down on a breakaway. On the second chance, Penguins goaltender Anthony Peters made a blocker save to keep the game scoreless. Later in the period, Di Pauli would see similar opportunities for Wilkes-Barre and hit pay-dirt on two occasions. First, Di Pauli scored unassisted at 7:06 after a blocked out in the Bears offensive zone led to a scoring chance the opposite direction. Hershey goaltender Ilya Samsonov went for the poke check, but Di Pauli pulled to the open side of the net before running out of real estate. Di Pauli scored again on his second breakaway chance of the period at 16:01. Following another blocked shot, Di Pauli scored on Samsonov from the slot, high-glove side. Wilkes-Barre added a key insurance marker in the second period on their first power play chance of the night. After a Brian Pinho slashing minor, Ryan Haggerty received credit for the goal after a puck glanced off his skate and into the net at 4:52. After a lengthy video review for a potential kicking motion on the play, the goal stood. Shots after 40 minutes were 22-16 Pens. The Bears added their lone goal in the first minute of the third period to pull within 3-1. On a 2-on-1 rush, Sergei Shumakov sent a crisp, cross-ice feed to Jayson Megna for the easy tap in at :28. The goal for Megna marked his third straight game scoring, and his fifth in the past seven games. Peters remained perfect in goal for the remainder of the night to backstop the Pens to a 3-1 win. Final shots on goal were 29-27 Wilkes-Barre/Scranton. Hershey's power play finished the night 0-for-3 while the penalty kill went 2-for-3.